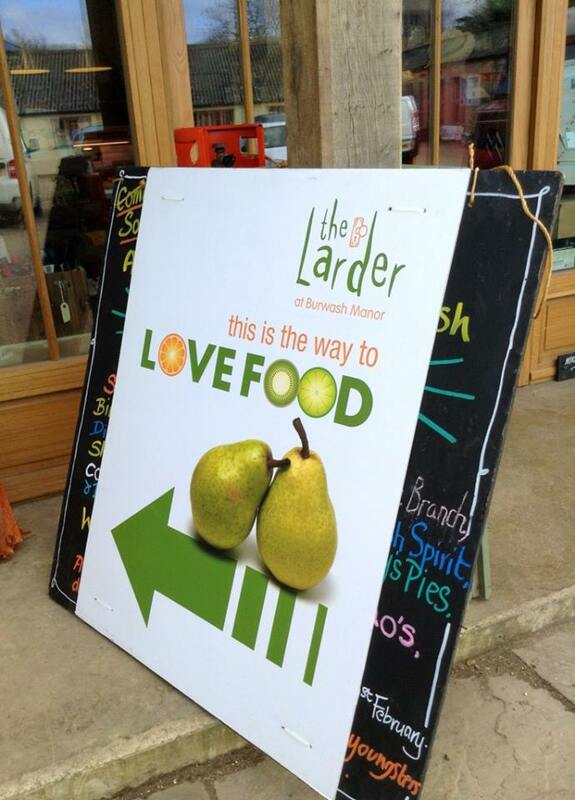 Love Food, Burwash Manor‘s “fabulous festival of foodiness” was held on 15-16 February, 2014 at Burwash Food Hall and The Larder. I love events like this as they’re perfect for discovering a variety of new products. It’s always exciting to see what independent food producers are concocting in their kitchens and how they bring their ideas and products to fruition for the enjoyment of food enthusiasts like me. It’s also a rare opportunity to interact with the producers and for me, the best part is hearing them talk passionately about their products. I can’t help but admire people who have the strength, drive and determination to set up their own food business… and they all do it because they love food and want to share their products with the world. I was at Love Food on both days and I was delighted to sample some tasty foods and speak to the creators of these wonderful flavours. 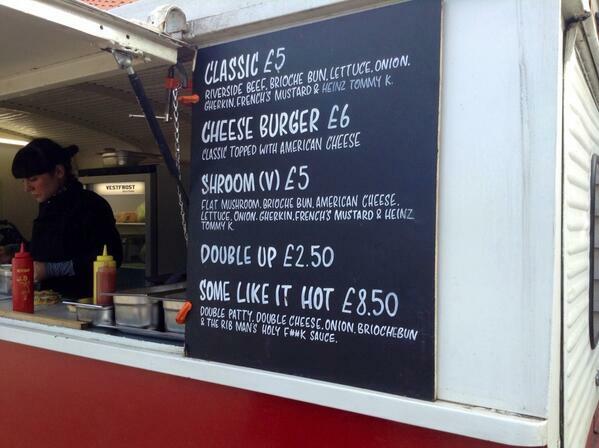 The first order of the day was an obligatory visit to the Steak & Honour burger van. 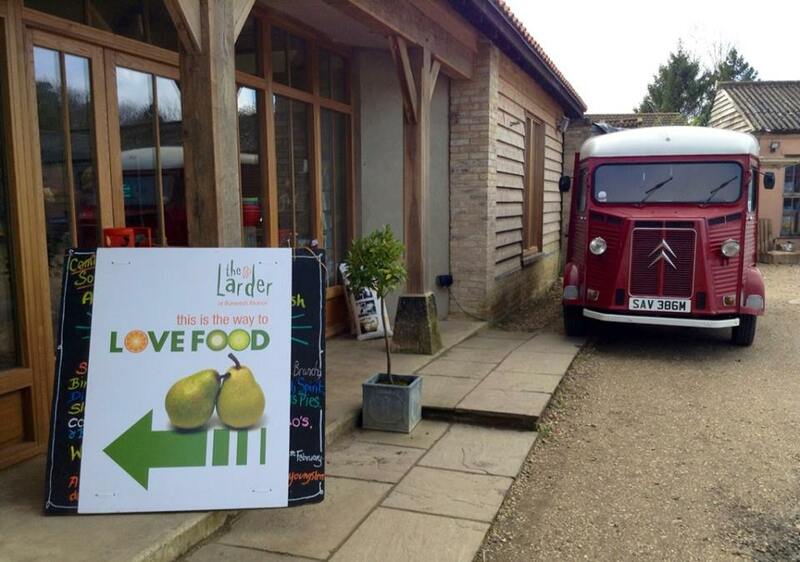 The husband and wife team who run this business have it down pat… charming vintage truck and the freshest ingredients. They don’t cut corners: everything from the beef to the condiments comes from ingredients of the highest quality. Put all this in a tasty brioche bun from the excellent Dovecote Bakery and you have a winning burger! 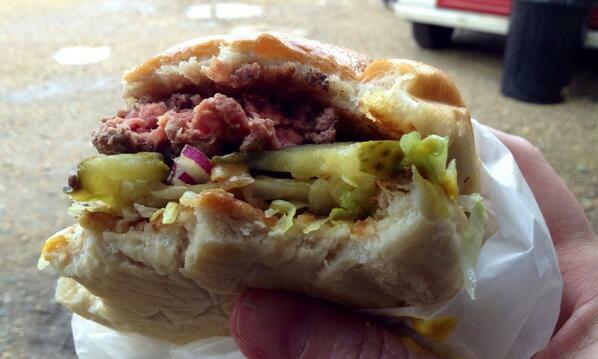 I had my favourite… the Classic burger with lettuce, onion, gherkin, mustard and ketchup. It was a nice fat juicy burger, freshly prepared and nicely packaged to take away. It was served with 3 big napkins but surprisingly, it wasn’t that messy to eat! Bim’s Kitchen were there and I was able to chat at length with co-owner Nicola who spoke passionately about the business she and husband “Bim” created. 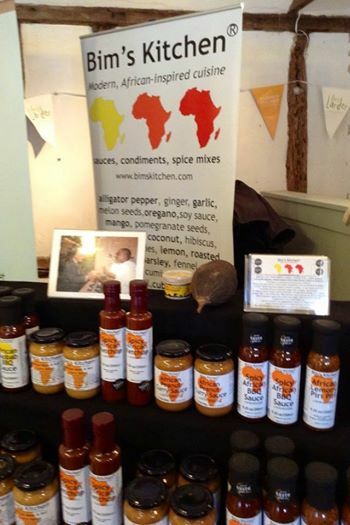 They offer a unique range of African-inspired sauces and condiments. When I visited Senegal over 20 years ago, I was amazed by the majestic baobab trees so I was seriously impressed when Nicola showed me an actual baobab fruit, complete with a fascinating lesson on its powder. 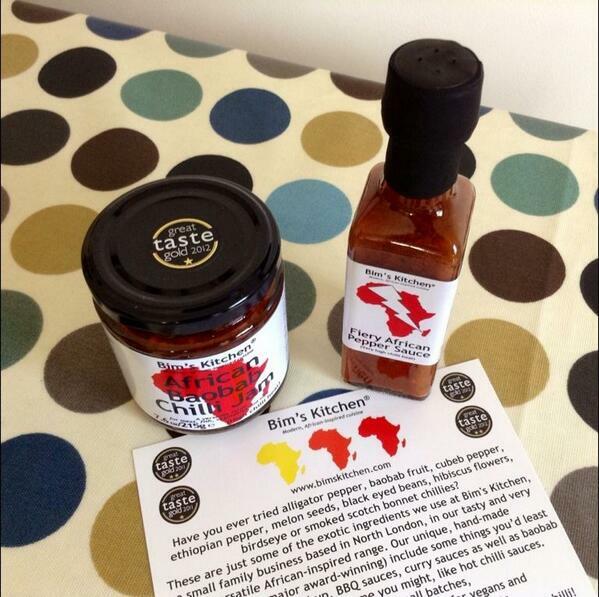 After some sampling, I decided to go for their African Baobab Chilli Jam and Fiery African Pepper Sauce. Their marketing card included a recipe for Chilli Coconut Prawns that sounded so tempting, I found myself returning the next day to pick up a jar of their African Chilli Coconut Relish. 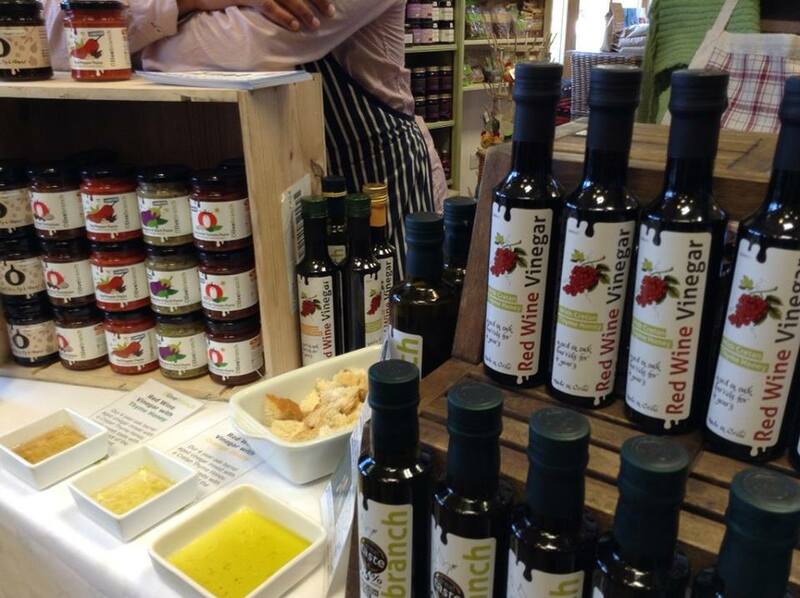 Olive Branch offer an exciting range of Greek products: olive oils, red wine vinegars and spreads. 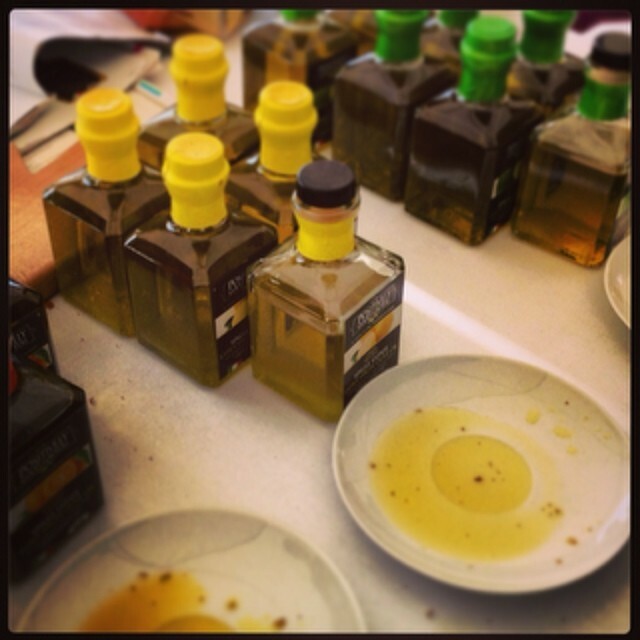 The personable Maria, who founded the company, is from Crete and her family owns their own olive trees. Perfect! I sampled some of the spreads and they were bursting with flavour. The vegetables really stood out, giving the paste a super fresh taste. 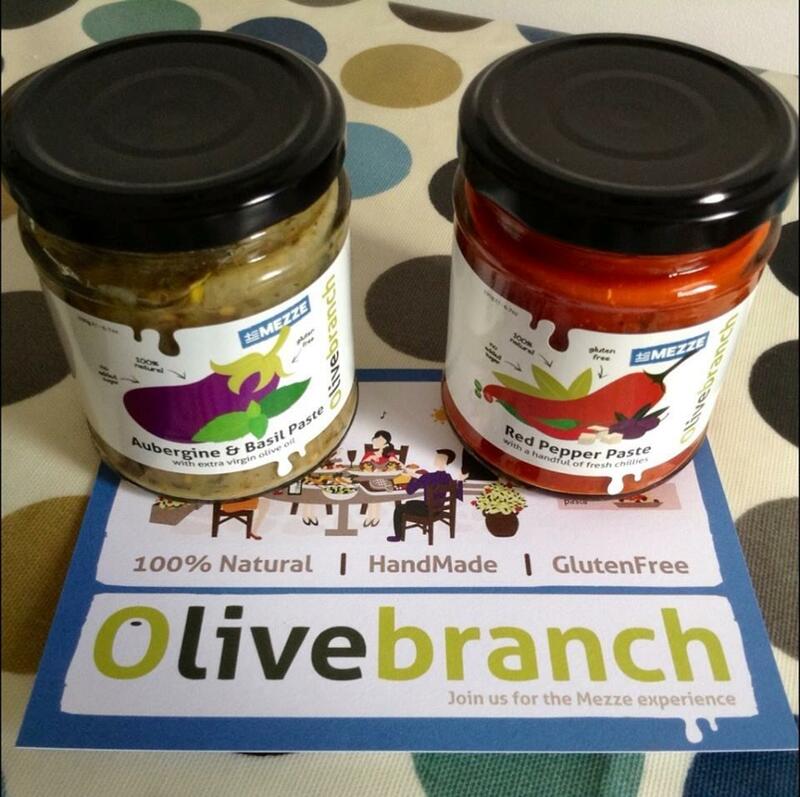 I was hooked on the Aubergine & Basil as well as the Red Pepper pastes from their Greek Mezze range. I spread them on crackers when I got home but I will be cooking with the pastes as well. Their website includes some great recipes. I was told the Red Pepper paste goes very well with eggs. 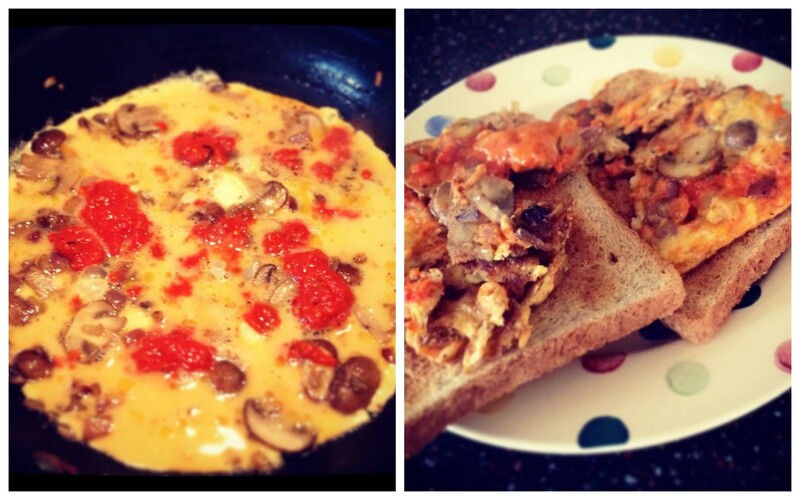 So for a quick and easy lunch, my husband whipped up a mushroom, red onion and shallot frittata… and jazzed it up with their Red Pepper paste. It wouldn’t have been nearly as delicious without the paste. This is going to be our ‘secret ingredient’ from now on! 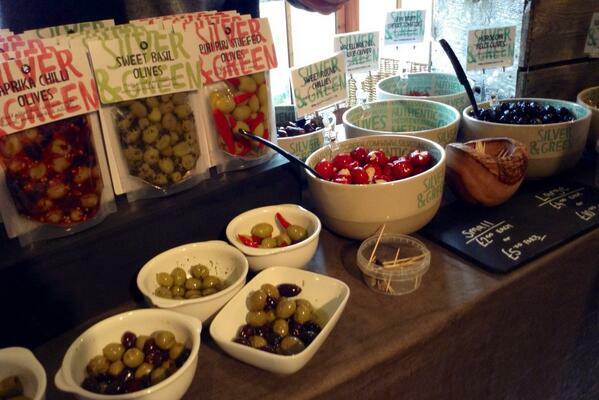 Smiling Rachel of Silver & Green had a stand featuring a selection of gorgeous olives that really caught my eye. I chose the plump and juicy Nocellara olives as well as green olives stuffed with sundried tomatoes with some spicy ones thrown in for good measure. I also took home some cheese-stuffed red peppers. 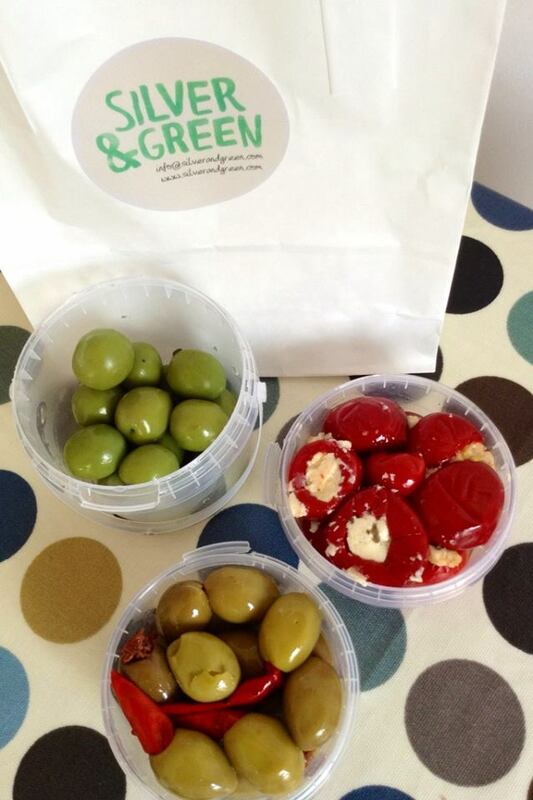 The olives and peppers were so addictive… we ended up having all of these as our dinner! The lovely ladies from The Kandula Tea Company had an impressive selection of teas on display. I only knew of their English Breakfast and Earl Grey teas so I was pleased to see their complete range of teas and infusions. I decided on three teas: Pink, Mint and Mango Green. I had a wonderful and fragrant cup of Mango Green Tea that evening and I’m looking forward to having their Ceylon Pink Tea. 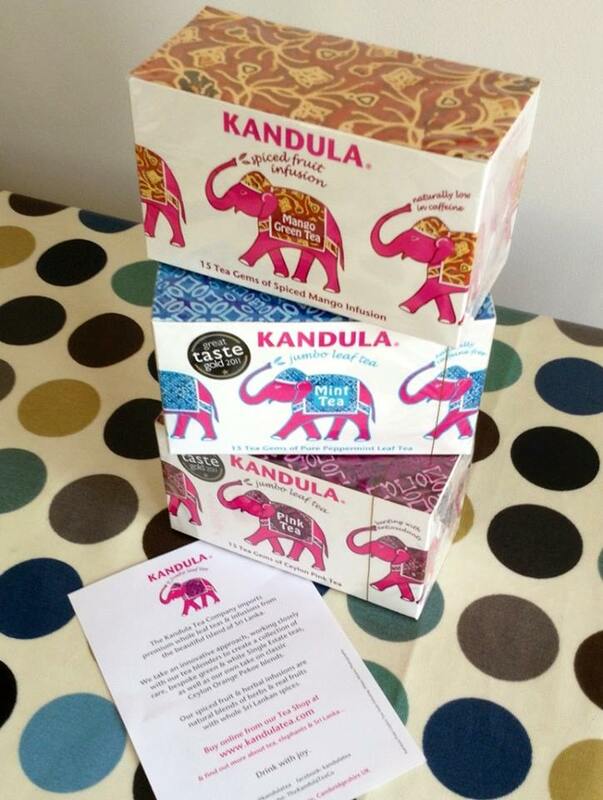 I’m always pleased when a restaurant or café serves Kandula so it was really great to meet the ladies behind the tea! I finally had the opportunity to meet chilli expert Ben of Capsicana Chilli Co as our cooking often includes their powders and spices. However, we never got around to trying the sauces. My husband loves anything spicy so he sampled their hottest sauce bhut jolokia, which he thought was great. It packed quite a punch (so he said… I wasn’t brave enough to try it). 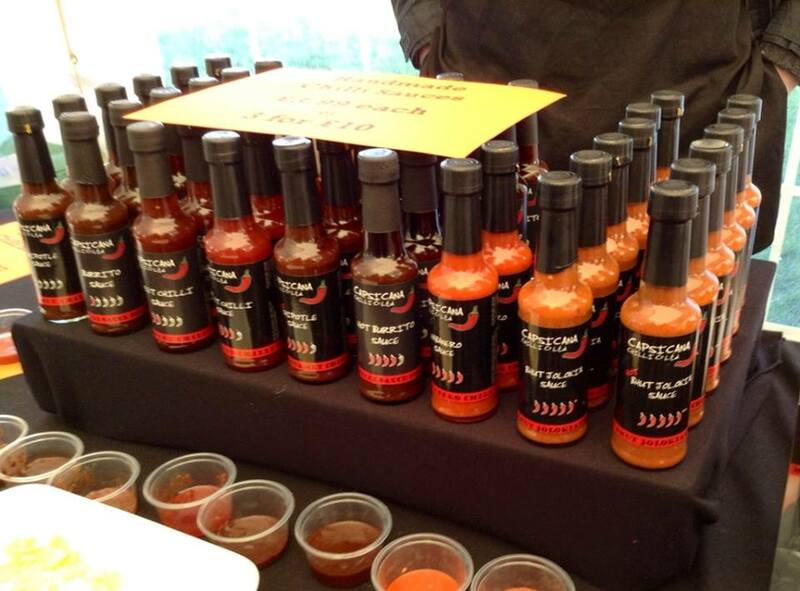 We also ended up getting two more sauces (habanero and sweet chilli) which will undoubtedly please our taste buds to no end! 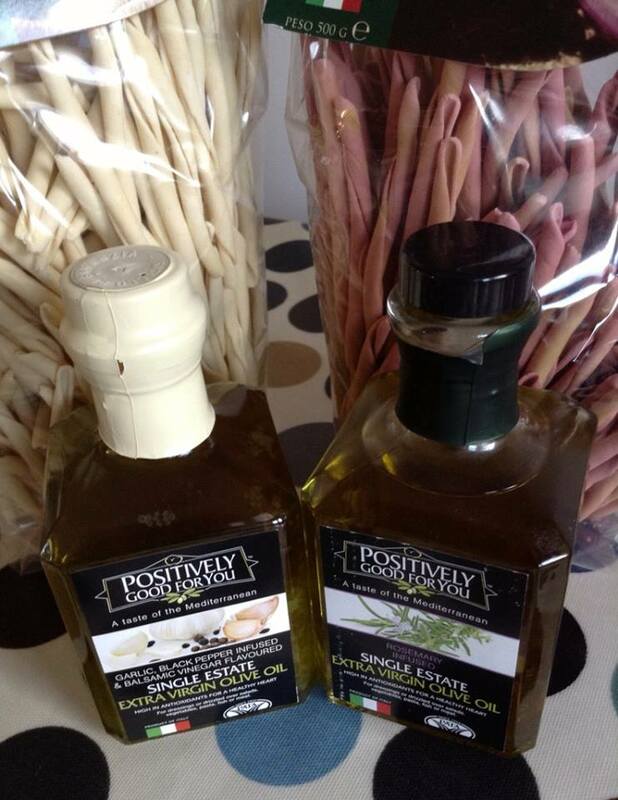 I’m a regular buyer of Positively Good For You’s extra virgin olive oils and it was nice to see Mauro again and speak Italian! I replenished my stock of olive oils (the chilli, rosemary and garlic & black pepper ones are my favourites) but also had the rare opportunity to get some traditional Calabrese pasta called “fileja” which are rolled with a thin metal rod. One of the fileja pastas is made with red onions so I’m really looking forward to trying it. Mustard Mary were represented as well. 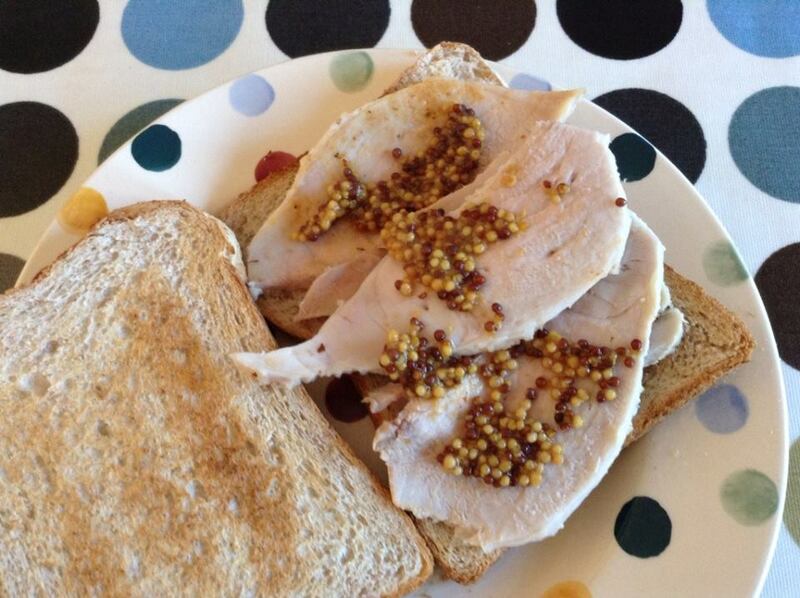 I’m still working on my jar of their crunchy wholegrain mustard with honey so I didn’t purchase anything this time. I have used it on cheese, with sausages and in a variety of sandwiches. My photo shows a quick lunch I put together with leftover pork, jazzed up with some Mustard Mary! And finally, everyone needs a little dessert. Biscotti di Debora’s cupcakes are not only works of art, they’re fresh, moist and well, just delicious! 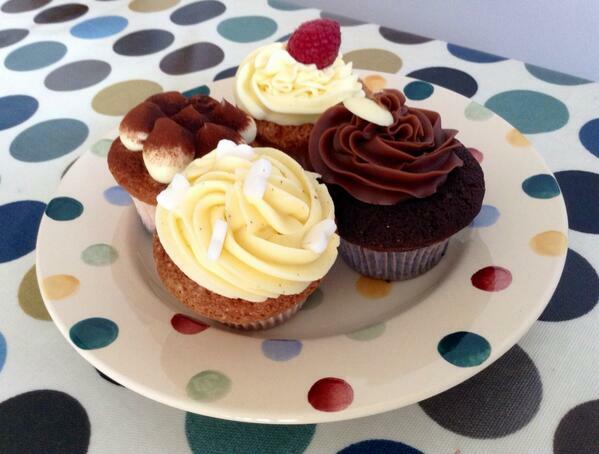 Her chocolate, lemon, raspberry and tiramisu cupcakes came home with me! Everything she bakes is wonderful… cantucci, cupcakes, cakes, the list goes on. Don’t leave Burwash Food Hall without getting a little treat to satisfy your sweet tooth once in a while! 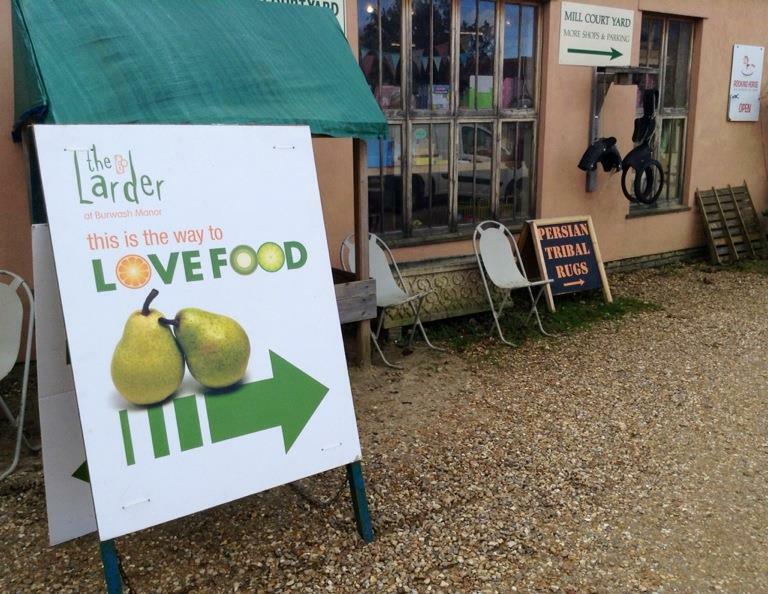 Love Food is not only a celebration of food, it’s a wonderful opportunity to get to know the independent producers who put their heart and soul into providing us with some tasty and enjoyable fare. I’m already looking forward to the next festival! This entry was posted in Food Events and tagged Barton, Bim's Kitchen, Biscotti di Debora, Burwash Food Hall, Burwash Manor, Cambridge, Capsicana Chilli Co, Dovecote Bakery, Love Food, Mustard Mary, Olive Branch, Positively Good For You, Silver & Green, Steak and Honour, The Kandula Tea Company by One Two Culinary Stew. Bookmark the permalink.